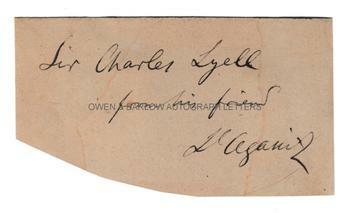 LOUIS AGASSIZ autograph Presentation Inscription to Sir Charles Lyell. Jean Louis Rodolphe Agassiz. Swiss born biologist and geologist. Autograph presentation, signed. To the eminent geologist Sir Charles Lyell. "Sir Charles Lyell from his friend L. Agassiz." On paper piece measuring approx. 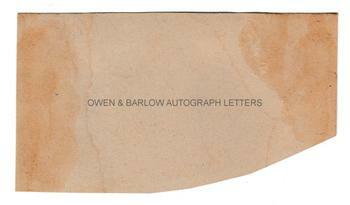 3 x 1.75 inches (7.5 x 4.75 cms). The presentation is probably cut from the fly-leaf of a book or scientific paper. Slight mounting traces to verso, else in fine condition. A nice association piece between two towering figures of 19th century science. Provenance: From the 19th century album compiled by the family of Dr James Copland FRS (1791-1870), the Scottisg physician and writer on medicine.